Family Engagement Lab creates digital products to help schools ignite the power of family engagement to improve student learning outcomes. 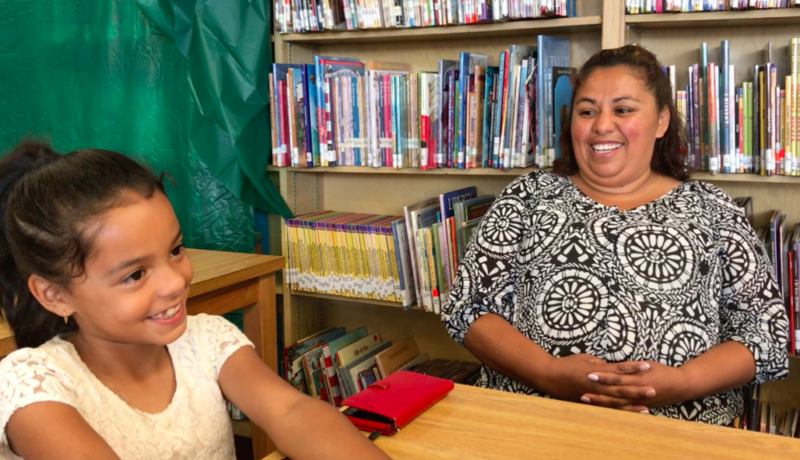 Their program, FASTalk (Families and Schools Talk) which is used by OUSD helps teachers empower all families through two-way messaging with automated translation. Family Engagement Lab is committed to supporting high-need families and communities. In this member spotlight we had the opportunity to speak with the diverse team that makes up Family Engagement Lab. We spoke with Vidya Sundaram, co-founder and CEO, Elisabeth O’Bryon, co-founder and Head of Research and Curriculum, along with Hannah Lee, their Senior Project Manager, about the strength of families to support their children’s learning, the importance of collaboration, and technology as a mode of connection. So Vidya, Elisabeth, and Hannah, what would you say is Family Engagement Lab’s hidden talent? Hannah- I think our hidden talent is right in our name — family engagement. Our focus is to leverage and engage families especially among diverse populations. I think there is a need for family engagement and a need for creative ways to engage families. At times teachers don’t know how to engage with families or vice versa, families might not know how to engage with teachers. We are providing the tools to do so. Elisabeth- I think to build off of that, the way that we facilitate family engagement as being part of our hidden talent is that we work hard to listen and put intention while working with parents and teachers. To see what they need and with that information it really drove our program FASTalk. Having a program that is designed to meet those needs enables our family engagement and approach to be successful. So the fact that our messages get automatically translated, they reach parents where they are on their phones, and uses this trusted source of the teacher providing valuable information to the families. Those are some of the pieces that we heard that are so important and that we have seen that actively support family engagement. What makes your organization stand out? Vidya- I think there are a couple things that make us stand out. One is the focus on the power of families to improve academic achievement for students and giving schools a very simple way to do that. I think there is a big challenge for schools to improve student outcomes, particularly for underserved and low income populations. There are very significant achievement gaps and it can be difficult for schools to leverage the assets of the community to do that. We believe our richest asset in our communities are our families. So our program really helps schools target and bring out those strengths of families to support their child’s learning and achievement in a way that really hasn’t fully been accessed at this scale. Elisabeth- With that academic piece, making it easier for teachers to deliver content and information that is engaging and curriculum-aligned so that the rich information can go into the hands of families. They then have the capacity to support their child’s learning, and parents and teachers can collaborate on these same skills and be supporting their children’s success in unison. You work closely with teachers when implementing FASTalk , can you share an anecdote that has stuck with you? Vidya-I think there are a lot of moments. From teachers, there is one teacher at Place @ Prescott and she is a TK teacher there. She shared a story with us about one of her student’s parents. She wasn’t sure about her relationship with the parent and one day she sat down with the student’s parent to talk and the parent started talking about FASTalk messages and just lit up and was excited about how helpful and important they were. The opportunity for these activities and messages to provide a breakthrough for this relationship and connection and to help that parent feel excited and connected to what’s happening in the classroom and their capacity and ability to help their child succeed in that classroom environment was a two-fold benefit that we heard from the teacher that was really exciting. So this was FASTalk’s contribution to both the parent’s capacity to support their child’s learning and improving the parent teacher relationship was something that came out of the story we heard from the teacher. I know you work more broadly and not necessarily based in the Bay Area but why does your organization support early literacy in Oakland? Vidya- I think in order for relationships, partnerships, or implementations to work there has to be commitment from multiple stakeholders. I think the reason why our organization supports literacy and early childhood education in Oakland is there is a need for the program in terms of the families. I think there is a significant population of parents that do not share a common language with their child’s teacher and the significant need for the number of students who are not proficient in key literacy measures. So from that point of view there is a really strong need here in Oakland and that there is a strong desire to improve those outcomes for students and a commitment. So what’s made our work in Oakland possible is the commitment of a dedicated group of district officials, school officials, teachers, the funding community, organizations like OLC, additional advocacy organizations around the city, and community partners as well that create the conditions for focused and targeted literacy programs that are family focused really to survive and be able to do our work. What do you see as the relationship between technology and literacy in your work? Hannah- The technology method or mode of connection that we use through technology is preferred by the parents. I believe that is why we are able to deliver these messages for parents to involve their kids at home and to support learning at home because it is preferred by the parents. Elisabeth- Yes, I think that is so important. How can the technology facilitate this important information sharing and recognizing parent’s preferences with in-home communication and what channels they want and are eager to be using. From there it was how can we get high quality evidence-based information in parent’s hands and leverage technology in that mission. As one OLC’s newer members, why did you decide to join the OLC Member Network? Vidya- I think the key reason is that we are a pretty new organization. A lot of our work has focused on literacy but in the context of supporting parent’s capacity to support literacy at home and we feel it’s important to participate in and support the community wide efforts that are very much aligned with what we are doing. Elisabeth- I agree, just opportunities for there to be joint learning and collaboration is a wonderful opportunity and one that we want to stay connected with. One more question, how would you describe Family Engagement Lab in one word? Elisabeth- Impactful. We are seeing really powerful insights qualitatively from teachers and parents that we have worked with. Seeing impact is so important in our work. This blog is a feature highlighting our OLC Member Network in action. We know that building a future where every Oakland child learns and loves to read will take all of us. That’s why we’ve built a thriving network of organizations to learn, collaborate, and champion literacy. Learn More about our Member Network by visiting our website. For questions about the Member Network, contact Sanam Jorjani at Sanam@Oaklandliteracycoalition.org.